Recreate the improvised, utilitarian style of turn-of-the-century factory furniture with help of this Nightstand. Crafted entirely from solid wood, this nightstand utilizes mortise and tenon frames, tongue and groove tops, and X-style panel sides for strength and durability. Showcasing roughhewn plank design with saw marks and exposed hardware in a rustic gray pine finish, this nightstand features two drawers to store your bedside essentials close at hand and one pull out tray at the top to hold your morning cup of tea. Add this nightstand next to your bed to create a rustic and functional bedroom where you can truly relax. Product Care-Do not use strong liquid cleaners. The nightstand features two drawers and one pull out tray. The nightstand has a durable wood construction that is built to last. 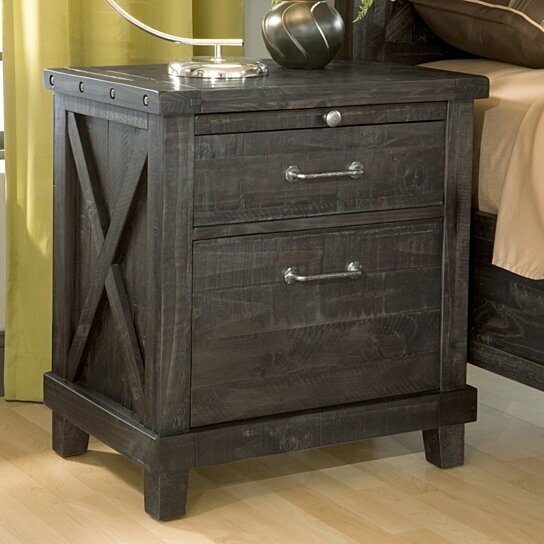 X-style panel sides and exposed hardware adds to the factory look of this nightstand.